Neuron migration is regulated by numerous cell autonomous and non-cell autonomous factors. 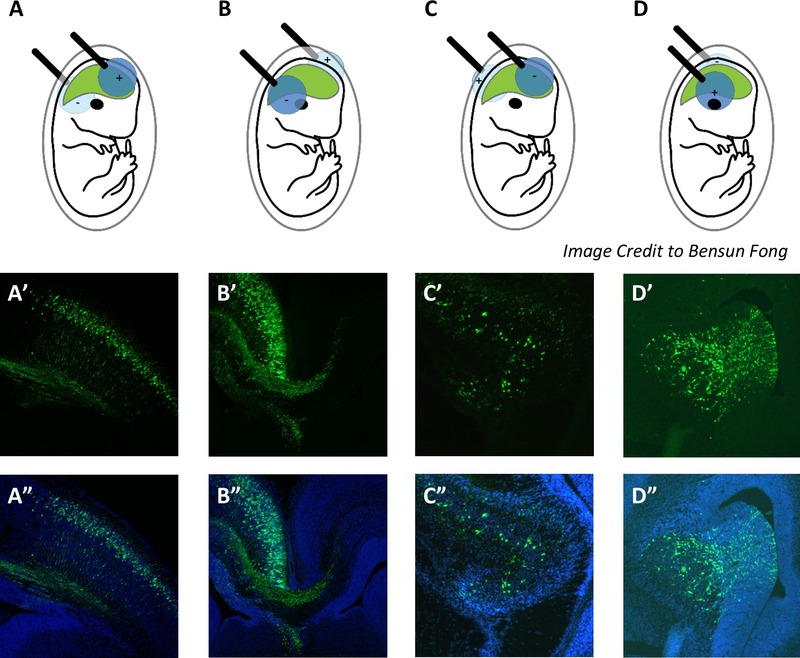 This protocol shows how in utero electroporation can be used to determine whether a phenotype in a transgenic mouse is due to disruption of a cell intrinsic mechanism or impairment of interaction between the neuron and its environment. Svoboda, D. S., Clark, A., Park, D. S., Slack, R. S. Induction of Protein Deletion Through In Utero Electroporation to Define Deficits in Neuronal Migration in Transgenic Models. J. Vis. Exp. (95), e51983, doi:10.3791/51983 (2015). Genetic deletion using the Cre-Lox system in transgenic mouse lines is a powerful tool used to study protein function. However, except in very specific Cre models, deletion of a protein throughout a tissue or cell population often leads to complex phenotypes resulting from multiple interacting mechanisms. Determining whether a phenotype results from disruption of a cell autonomous mechanism, which is intrinsic to the cell in question, or from a non-cell autonomous mechanism, which would result from impairment of that cell’s environment, can be difficult to discern. To gain insight into protein function in an in vivo context, in utero electroporation (IUE) enables gene deletion in a small subset of cells within the developing cortex or some other selected brain region. IUE can be used to target specific brain areas, including the dorsal telencephalon, medial telencephalon, hippocampus, or ganglionic eminence. This facilitates observation of the consequences of cell autonomous gene deletion in the context of a healthy environment. The goal of this protocol is to show how IUE can be used to analyze a defect in radial migration in a floxed transgenic mouse line, with an emphasis on distinguishing between the cell autonomous and non-cell autonomous effects of protein deletion. By comparing the phenotype resulting from gene deletion within the entire cortex versus IUE-mediated gene deletion in a limited cell population, greater insight into protein function in brain development can be obtained than by using either technique in isolation. Radial migration is a central process to early cortical development. It depends on a variety of cell autonomous factors, such as correct mitotic exit and neuronal differentiation, cell polarity, regulation of cytoskeletal dynamics and expression of transmembrane receptors, as well as non-cell autonomous factors, such as formation of the radial glial scaffold and secretion of migratory guidance molecules1-3. Since disruption of any of these mechanisms can impair neuronal migration in a transgenic mouse model4-8, determining the underlying cause of a defect in migration can be a complex and difficult process. In utero electroporation (IUE) can be used to complement and simplify interpretation of the phenotype of a genetic knock-out model and thereby elucidate important mechanisms required for radial migration7,9-11. In utero electroporation (IUE) is the process by which a plasmid carrying both a gene of interest and a reporter is injected into the ventricle in the brain of a mouse or rat embryo and then drawn into the cells lining the ventricle through use of an electric current12-14. This allows the investigator to analyze the effect of up or down regulation of a gene of interest in development or function of electroporated neurons. Following IUE, brains can be processed for immunohistochemistry 7,9-11, electrophysiology 15 or cell culture 16,17. The major advantage of IUE is that is allows for highly specific manipulation of gene expression. Furthermore, IUE can be used to target a specific region of the developing brain through a directed current (Figure 2). IUE can also be used to target a specific cell type through injection of plasmids carrying genes under control of various promoters or plasmid activation systems (tetracycline induced gene expression is an example) 10,18-21. IUE can be used in conjunction with the Cre-Lox mediated gene excision system 7-9,11,22. A plasmid containing a gene encoding the message for the Cre protein can be electroporated into an embryo homozygous for the floxed allele (in which the gene or specific DNA regions are flanked by two loxP sites for Cre mediated DNA recombination). Cre will then induce recombination of the gene of interest specifically in electroporated neural precursors, generating a knock-out of the floxed allele.The effect of protein knockdown on neural migration and development within individual neurons can then be studied. Electroporation of Cre induces recombination in only a small population of affected cells, leaving the supporting environment intact. In contrast, tissue specific expression of Cre under control of a cell type specific promoter, occurs throughout the entire tissue so that both migrating neuroblasts and the surrounding environment could be affected. Thus, juxtaposition of these two approaches can determine whether a given migration defect is due to cell autonomous or cell non-autonomous mechanisms. Defective migration in both experimental systems suggests that the observed phenotype results from a cell autonomous mechanism; normal migration following electroporation of Cre with defective migration in a tissue specific Cre model indicates that the gene of interest is acting through a non-cell autonomous mechanism. IUE can also be used to perform rescue experiments by electroporating potential interacting genes into knock out animals 7,9,10. For example, an investigator could attempt to rescue a migration phenotype in a transgenic model by electroporating a downstream target and determining if the migration defect is corrected in the electroporated neurons. This has the additional benefit that a successful rescue indicates that normal migration can be restored by manipulating protein expression in a specific neuron, even though the surrounding environment is still deficient for the targeted gene. Again, this approach is more time and cost effective than crossing or generating transgenic lines, with the added benefit of determining whether the defective mechanism is cell autonomous. IUE can be used to track migrating neurons through electroporation of a reporter plasmid into knock out embryos (Figure 4C). 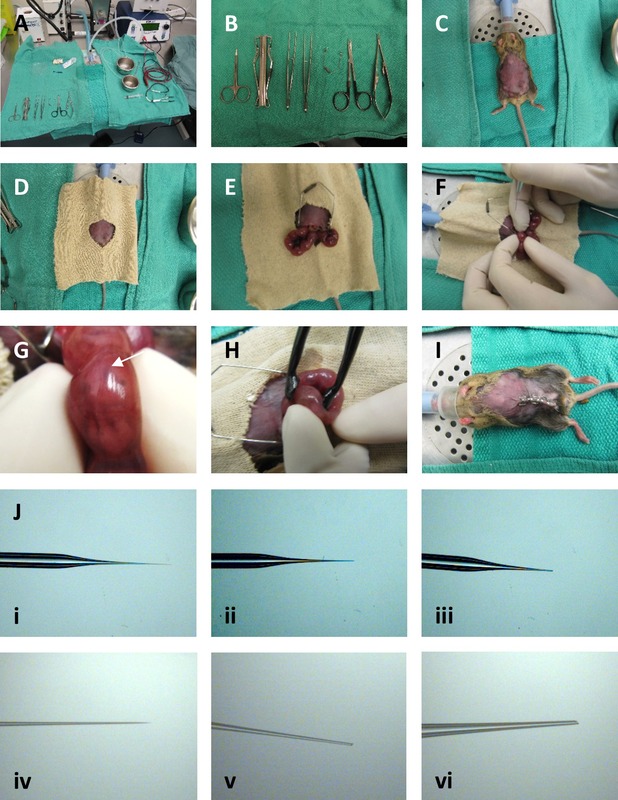 As only the neurons lining the ventricle at the time of surgery are electroporated 17, IUE can be used to follow the neurons born at a specific time with the advantage of visualization of their morphology in vivo. Finally, it is possible to use IUE to target brain regions such as the medial or dorsal telencephalon, hippocampus or ganglionic eminence (Figure 2). This gives researchers the power to investigate gene function in a specific area independent of complications resulting from protein knockdown in neighboring structures. Retinoblastoma protein (pRb), p107 and p130 comprise the pocket protein family and are well established regulators of cell cycle exit. However, there is increasing evidence that these proteins also regulate cell cycle independent aspects of neural development. As we have previously shown, pRb and p107 play a crucial role in both tangential 4,23 and radial migration 6. Here, we demonstrate the role of pocket protein family members pRb and p107 on neural migration 6 to exemplify the use of in utero electroporation of Cre in a transgenic model. In summary, IUE provides a powerful way of analyzing cell autonomous effects of gene deletion (or overexpression). When combined with tissue specific knock out models, IUE can provide additional information regarding the mechanisms controlling neural migration. NOTE: All experiments were approved by the University of Ottawa’s Animal Care ethics committee, adhering to the Guidelines of the Canadian Council on Animal Care. Prepare plasmids using the Qiagen MegaPrep according to the manufacturer’s protocol. Innoculate at least 400 ml of LB broth with transformed bacteria to ensure a high DNA yield and incubate overnight. Resuspend plasmid in 100-200 µl TE to a final concentration of at least 5 µg/µl. Aliquot DNA and store at -20 °C. If the concentration is too low, do not precipitate and resuspend as this can add impurities. Start over with a new preparation. Before surgery, dilute a single plasmid (Cre-GFP for example) to 2 µg/µl in sterile water with 1 µl of 0.1% (w/v) Fast Green dye per 10 or 20 µl of diluted plasmid solution. If GFP and the gene of interest are to be co-electroporated on separate plasmids, inject the GFP plasmid and the plasmid carrying the gene of interest at a ratio of 1:4 to maximize the likelihood that all cells marked with GFP are co-electroporated with both plasmids. Pull glass microcapillary tubes (1 mm outer diameter - hereafter referred to as needles) on a standard needle puller, using a single step pull at 62 °C. Autoclave a surgical pack containing the following: needle holders, wound retractor, forceps, scissors for surgery, scissors for needles, stapler, staples, gauze, wound covers, surgical drapes (Figure 1A, B; Materials Table). Collect other required tools: Electroporator, Femtojet Microinjecter, Tweezertrodes (5 or 7 mm), saline, suture, 5 ml syringe (Materials Table). For pain management, inject a timed-pregnant mouse with Buprenorphine (0.05 mg/kg body weight) one hour before surgery. Apply this protocol to mice timed anywhere from embryonic day 12.5 (E12.5) to E17.5. Use microloader pipette tips to back-load pulled needles with the plasmid solution. Do not fill all the way into the tip of needle yet as this will cause the needle to become clogged. Anaesthetize mouse using 2-5% isoflurane gas with 1 L/min O2. Once immobile, place in face mask and apply ointment to eyes to prevent drying. Inject with 1 ml saline (0.9% NaCl) subcutaneously in back. NOTE: When working with isoflurane gas, use a gas scavenger to recapture excess gas and prevent it from escaping into the room. Shave abdomen. Wash abdomen with Chlorohexadine scrub, rinse with water, and apply a final prep solution of chlorohexadine and 70% ethanol. Cover mouse with sterile drape or gauze to cover fur but leave abdomen exposed (Figure 1C, D). Make an incision in the skin over the abdomen between the lower teats. Pull the skin away from the underlying muscle layer by tearing the connective tissue, then cut through the peritoneum into the abdominal cavity along the linea alba. Insert the wound retractor to pull the edges of the wound apart. Remove the uterus from the abdominal cavity and lay it out as shown (Figure 1E). If different pups are to be injected with different plasmids (such as GFP vs. GFP with the gene of interest), count the pups on each side and decide which ones and how many to inject with each plasmid. Replace one side of the uterus back into the abdomen to keep the embryos warm and lubricated. Immediately moisten the exposed uterus with saline (preferably warmed to body temperature). If injecting all pups with the same plasmid (such as when injecting Cre-GFP into transgenic embryos) only remove one horn of the uterus at a time. Put a loaded needle in the grip head of the injection wand and carefully cut the tip with a pair of small surgical scissors or fine forceps. Cut the tip so the needle stays as long as possible while still allowing fluid to pass through (Figure 1Ji-iv). Adjust length of injection (in seconds) and injection pressure on the microinjector so that a small yet easily visible droplet of 0.1-0.2 µl appears on the tip of the needle when the foot paddle is pressed. Keep the volume of this droplet as consistent as possible between different needles. NOTE: this step is crucial for embryo survival (see discussion). Use the following injection parameters for the Femtojet: injecting pressure (pi) = 250-300 hPa; injection time (ti) = 0.8-1.2 sec; compensation pressure = 10-50 hPa. If required, adjust these parameters to accommodate variation between needles. Select an embryo and gently position it on its back, head tilted upward (Figure 1F). NOTE: This may require turning or shifting the embryo; be careful not to apply too much pressure and avoid rupture of the amniotic sac while manipulating the embryo. Once the embryo is in place, locate the ventricle, which presents as a crescent shaped shadow parallel to the sagittal sinus. Touch the tip of the needle to the uterus above the ventricle at a slight angle and guide the needle through the uterine wall. The amount of pressure required depends on the sharpness of the needle. Push the needle through the cortex into the ventricle. NOTE: Although there is rarely any additional detectable resistance, the embryo’s head is often pushed away slightly and then recoils as the needle passes through the cortex into the ventricle. Pump the foot paddle to inject the plasmid solution. Continue to pump until a green area is visible and conforms to the arc shape of the ventricle (Figure 1G). In young embryos (E12.5 to E14.5) the dye will often diffuse into the contralateral ventricle. NOTE: The number of pumps depends on the diameter of the needle tip, the age of the embryo (and resulting size of the ventricle) and the desired injection volume. Keep volume injected as consistent as possible between embryos. Inject three or four embryos. Keep all exposed embryos moist with saline throughout procedure. Go back to the first embryos injected and place the paddles such that the positive electrode will draw the plasmid into the desired region of the brain (Figure 1H). Angle the negative electrode so that the shortest path between the electrodes passes directly through the structure targeted for electroporation (Figure 2). Once the paddles are in place, apply the shock. Depending on the age and size of the embryos, use 5 pulses of 35-50 V (see Table 1). Use the following electroporation parameters: pulse length of 5 msec with a pulse interval of 950 msec. Repeat with all injected embryos. Cut the tip of new pre-loaded needle as in step 3.3 as the last needle likely dried and clogged during step 3.9. Inject the next set of three or four embryos with either the same plasmid or a different plasmid and then apply the shock as in step 3.9. When all the pups in one side of the uterus are injected, remove the second side of the uterus from the female’s abdomen and then replace the completed side to keep it warm. While suturing, progressively turn down the isoflurane to allow the pregnant female’s anesthesia to lighten. NOTE: This will expedite arousal of the dam after the surgery is complete; keeping the female anesthetized for as short a time as possible will improve embryo survival. Total surgery time, starting from when the female is first anaesthetized, should be approximately 30 min. Place the sutured female in an incubator or on a heating pad to recover from anesthesia. Bed her on clean bedding and place a standard recovery gel in the cage maintain hydration. For pain management following surgery, give the female three doses of Buprenorphine (0.05 mg/kg body weight) at 8 hr intervals following surgery, then four additional doses at 12 hr intervals. NOTE: Brains can be harvested at any age up to adulthood. The following applies for collecting brains prior to birth. Note that once pups are born, the order within the uterus is lost, so either every pup in the litter must be injected with the same plasmid, or another method of differentiating between control and experimental animals must be devised. Prepare cold (4 °C), filtered 4% paraformaldehyde (PFA) prior to euthanizing female. Euthanize the female using an intraperitoneal injection of a lethal dose of sodium pentobarbital (100 mg/kg body weight) and cut open abdomen. Pull out both sides of the uterus and lay out as when pups were initially injected. In the case where all pups received the same plasmid, such as when injecting Cre into a transgenic litter, embryo order is not important, therefore cut the uterus out of the female and place in PBS. If pups were injected with different plasmids, be sure to locate each pup, noting any dead pups, and determine which ones were injected with control and experimental plasmids before removing the uterus from the female. Be careful to keep track of which pup belongs to which group after the uterus is in PBS. Remove each pup individually, decapitate with sharp scissors or a razor blade and place the head in PBS. In the case of transgenic mice, collect tissue samples for genotyping and keep each head separate, such as in a 12-well plate. Under a dissecting scope, remove the brain from the skull, being careful not to nick the cortex or tear the midline. Using a fluorescent microscope, check to see if brains have a GFP+ patch, indicating that they were electroporated successfully. Fix brains by immersion in PFA at 4 °C overnight. NOTE: Check brains for expression of GFP prior to fixation since PFA often quenches the signal. Cryoprotect brains through immersion in 20% sucrose for at least three days prior to freezing. Use a sucrose gradient of 10%, 15% and 20% (24 hr in each solution) to prevent tissue damage due to osmotic pressure. Store frozen brains at -80 °C and cut on a cryostat at 10-14 µm thick sections. NOTE: If antigen retrieval is necessary in order to co-stain with anti-GFP, it is important to use a gentle antigen retrieval protocol that does not compromise the GFP signal. Some antigen retrieval protocols are too harsh to use in conjunction with GFP staining (even with an antibody against GFP). A basic citric acid pre-treatment prior to application of the primary antibody is successful for most epitopes 24. Make a 0.01 M solution of citric acid in ddH2O. pH to 6 using a calibrated pH meter. Heat citric acid in staining chamber in microwave or water bath until citric acids reaches 75-80 °C. Put slides in staining chamber for 10-15 min. Maintain temperature as stable as possible. Wash slides in PBS 3x for 3 min at room temperature. Apply the primary antibody and proceed with immunostaining according to a standard protocol. Validate Cre mediated excision by co-labelling for GFP and the gene of interest to confirm knock down (Figure 3A). Different regions of the brain can be targeted for electroporation by varying the orientation of the paddle electrodes over the embryo’s head (Figure 2). For all parts of the forebrain, the plasmid is injected into the lateral ventricle (the hind brain can be targeted by injecting into the fourth ventricle). In general, place the electrodes so that the straight line between them passes through the region of interest, with DNA being drawn toward the positive electrode. To target the lateral cortex (Figure 2A), place the positive electrode on top of the green crescent, with a slight rostral angle. For the medial cortex (Figure 2B), switch the orientation so that the positive electrode is over the contralateral non-injected ventricle, this time with an even larger forward angle. To target the hippocampus (Figure 2C), place the positive electrode over the contralateral side, but instead angle the positive electrode caudally (electroporations must be done at an age when the neural precursors are still part of the cortical hem, prior to migration to the final location of the hippocampus). To target the ganglionic eminence (Figure 2D) place the paddles on the embryo in line with the ears, with the positive electrode slightly lower than the negative electrode. Representative images of these electroporated regions are shown in Figure 2. It is important to validate Cre-mediated excision in electroporated brains. The ideal approach is to perform in situ hybridization or immunohistochemistry against the transcript or protein in question. Unfortunately, as is the case for pRb, reliable probes or antibodies are not always available against the deleted gene. In these cases, alternative approaches, such as staining for a downstream target regulated by the deleted gene (Figure 3A) or confirming excision of the targeted allele in electroporated sections by PCR (Figure 3B), can be used. For example, Figure 3A confirms Cre mediated excision by reproducing a well-documented effect of pRb/p107/p130 gene deletion in electroporated neurons. Following electroporation of pRb f/f; p107 -/-; p130 f/f neurons with the pCig2-Cre plasmid, these triple knock out GFP+ cells continue to express the cell cycle progression marker Ki67, which is a known effect following excision of pocket proteins25. Control GFP+ neurons electroporated with the empty pCig2 plasmid do not express Ki67. The Cre plasmid should also be tested in vitro through co-transfection with a plasmid carrying a reporter gene behind a floxed stop codon, such as the NL-dsRed plasmid (Figure 3C) in a cell line, but this should only be used in combination with other in vivo techniques. Due to the variation between electroporated brains, analysis of electroporated neurons requires calculating the percentage of total GFP+ neurons that portray a specific characteristic, such as expression of a protein marker or location within a given cortical layer. It is crucial to compare electroporated sections from similar anatomical locations within the brain relative to known landmarks. For example, images for Figure 4 were taken at the level of the anterior commissure. Furthermore, due to horizontal migration, images taken near the edge of the electroporated regions have a higher proportion of mature neurons that have reached the cortex, while images taken near the middle of the electroporated region have both mature and immature GFP+ cells. To insure consistency, it is important to quantify images selected from similar places within the electroporated patch. Following Emx1-Cre mediated deletion of pRb and p107 in pyramidal neurons in the dorsal telencephalon, a population of neurons expressing the upper cortical layer marker FoxP1 were mislocalized to the intermediate zone (IZ) (Figure 4A). There are significantly more FoxP1+ cells in the IZ of double knock out (DKO) brains compared to control brains with a corresponding decrease in the number of FoxP1+ cells in the upper cortical layers (above layer IV) of DKO brains than found in the upper layers of control brains (Figure 4B). There was no corresponding defect in the radial glial scaffold (Figure S2 of Svoboda et al., 2012) 6. Here we compare expression of cortical layer markers Tbr1, FoxP1 and Cux1 in pRb f/+; p017 +/-; Emx1-Cre + (wild type (WT)) brains to expression of these same markers pRb f/f; p107 -/-; Emx1-Cre + (DKO) brains. Heterozygote embryos can be used as controls since pocket proteins exhibit autoregulation at the protein level and heterozygote animals are aphenotypic 26. It was unclear whether these FoxP1+ cells were found in the IZ because these cells were immature neurons inappropriately expressing FoxP1, or whether they were earlier born neurons that had failed to migrate. To distinguish between these possibilities, we electroporated GFP into the wild type (WT) and double knock out (DKO) embryos at E14.5 and tracked the progress of these neurons over 4 days. Although this technique does not conclusively identify the final cell division, as with BrdU birthdating, it does allow the tracking of newborn neurons since it marks the discrete set of neurons derived from cells lining the ventricle at the time of electroporation 17. As shown in Figure 4C, all of the GFP+ neurons reach the uppermost cortical layer in the WT brains, but only a subset of these neurons reach the top of the cortex in DKO brains, indicating that there is in fact a defect in the migration of upper layer neurons, rather than improper expression of neuronal markers (similar results were obtained through traditional BrdU birthdating 6). Neuronal migration is a highly complex process that is regulated by a multitude of interconnected mechanisms 1-3. As it is very difficult to identify the mechanism underlying a migration defect in an uncharacterized transgenic model, distinguishing cell autonomous versus non-cell autonomous defects can facilitate phenotype characterization. 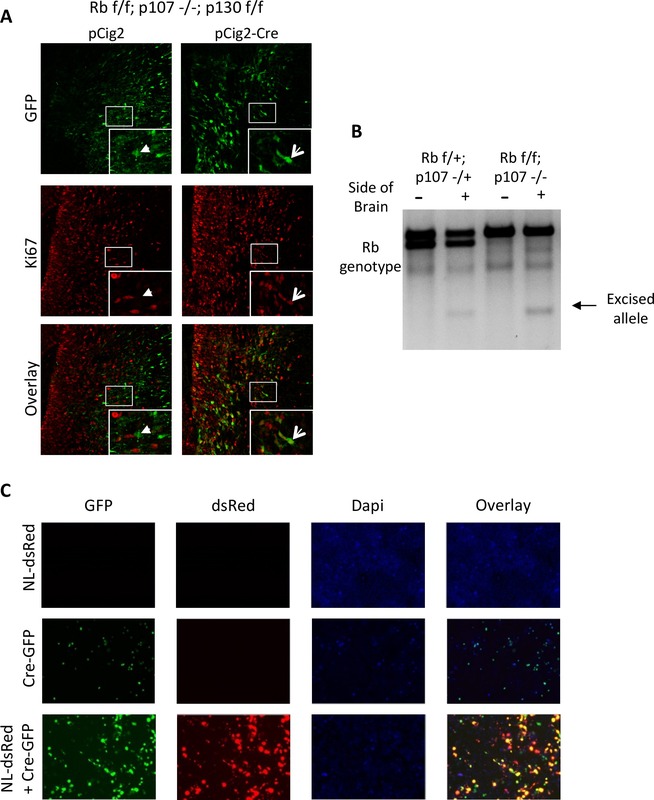 If following electroporation of Cre-GFP, GFP+ neurons fail to migrate in an otherwise wild type brain, this indicates that the mechanism disrupted by gene deletion is specific to the electroporated cell. Alternatively, if the electroporated neurons migrate normally in the wild type brain, this suggests that the cause of aberrant migration in the transgenic embryo is due to an environmental defect. Following electroporation of Cre-GFP in control pRb f/+; p107 +/- and double knock out pRb f/f; p107 -/- embryos, GFP+ neurons were found to migrate into the cortex in pRb f/f; p107 -/- brains, but many of these neurons failed reach the upper cortical layers as they did in control brains (Figure 4D) 6. There were significantly lower percentage of GFP+ neurons within the layer III/IV, marked by expression of FoxP127, in pRbf/f; p107 -/- electroporated brains than in control brains (Figure 4E). A Cre-GFP fusion protein was used to limit GFP fluorescence to the cell body and facilitate localization of the neuron to a specific cortical layer. Since the phenotype following electroporation of Cre is less severe than the phenotype following gene deletion throughout the cortex, this suggests that the original phenotype shown in Figure 4A is a combination of multiple mechanisms, both cell autonomous and not cell autonomous. Alternatively, it is possible that the time delay following electroporation, during which Cre is expressed, DNA recombination is performed, pRb is downregulated and the effects are manifested, is long enough to allow the electroporated neurons to reach the cortex before a migration defect becomes apparent. It should be noted that the distinction between cell autonomous and non-cell autonomous mechanisms should be interpreted with caution in brains with high electroporation efficiencies, where 100-200 or more neurons are electroporated in a single 14 µm thick section.If a high enough proportion of neurons are electroporated, GFP+ neurons may influence each other and create a small microenvironment. To be truly cell autonomous, migration defects must be detected even when electroporation efficiency is very low (10-30 GFP+ neurons per section). If necessary, the number of transfected cells can be lowered by decreasing voltage, pulse number or DNA concentration. All of these factors must be taken into consideration when analyzing the results following electroporation of Cre in a transgenic model. Figure 1: Performing In utero electroporation. (A) Sterile surgical set up. (B) Surgical tools from left: fine scissors for cutting needle tips; stapler; forceps; wound retractor; surgical scissors; needle holder. (C) Prepped pregnant mouse with shaved and disinfected abdomen. (D) Mouse covered with sterile drape prior to incision. (E) Uterus with E13.5 embryos removed from abdominal cavity. (F) Injecting pups in the ventricle. (G) Close up of injected pup; note the blue crescent on the embryo’s head indicating that the ventricle was successfully injected with the plasmid solution (arrow). (H) Paddles are placed to electroporate the lateral cortex. (I) Mouse post-surgery. (J) Preparing sharp needles is a crucial part of in utero electroporation. Examples of uncut needles (i, iv), good needles (ii, v) and poor needles (iii, vi) are shown at low (i-iii) and high (iv-vi) magnification. Please click here to view a larger version of this figure. Figure 2: Targeting different brain regions. Diagrams A-D show paddle placement for targeting different regions of the forebrains. The dark blue circle represents the paddle in front of the embryo while the light blue circle represents the paddle behind the embryo. Positive and negative electrodes are indicated with the appropriate sign. (A) Electrodes angled to target the lateral cortex. (A’, A”) Example of electroporation of the lateral cortex, three days after surgery. (B) Electrodes angled to target the medial cortex. (B’, B”) Example of electroporation of the medial cortex. (C) Electrodes angled to target the hippocampus. (C’, C”) Example of electroporation of the hippocampus. (D) Electrodes angled to target the ganglionic eminence (GE). (D’, D”) Example of electroporation of the GE. Please click here to view a larger version of this figure. Figure 3: Confirming Cre-mediated gene excision in electroporated neurons. (A) Cre mediated excision can be confirmed by co-staining for a downstream target of the deleted gene. pRb f/f; p107 -/-; p130 f/f embryos were electroporated with either the empty pCig2 plasmid or the pCig2-Cre plasmid and stained for GFP and Ki67, a marker of cell cycle entry. Double stained cells were seen in neurons electroporated with Cre (arrows in inset) but not in neurons electroporated with pCig2 alone (arrowheads). (B) Excision of pRb was also confirmed by performing PCR with genotyping primers on DNA extracted from the tissue sections removed from the slides. Sections were divided down the midline and the electroporated side of the section was pooled. The upper band represents the floxed allele and the lower band represents the wild type allele. The arrow indicates the excised allele in the electroporated side of the brain only. Because pRb f/+; p107 +/- heterozygotes were used as controls, an excised allele can be seen in the electroporated side of the brain in both the control and knockout brains. (C) Cre-mediated excision can also be confirmed in vitro using plasmids with floxed stop codons upstream of RFP, such as NL-dsRed. RFP is only expressed in HEK cells when co-transfected with Cre-GFP in Hek293 cells (bottom row), indicating that excision was successful. Please click here to view a larger version of this figure. Figure 4: Using IUE to study migration in transgenic mouse models. 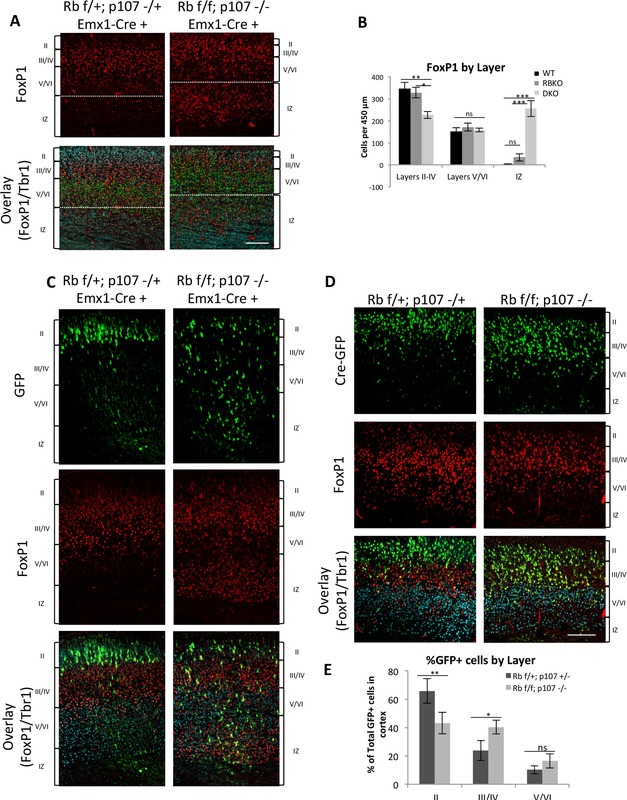 (A) Expression of FoxP1, a marker for layer III/IV cortical neurons, was examined in pRb f/+; p107 +/-; Emx1-Cre + (WT), and pRb f/f; p107 -/-; Emx1-Cre + (DKO) brains at E17.5. Overlay includes Cux1 (blue - marker for layers II-IV) and Tbr1 (green - marker for layers V/VI). A population of cells expressing FoxP1 was observed in the intermediate zone of DKO embryos (arrow), but not WT embryos, with a concurrent decrease in the number of FoxP1+ neurons in layers II-IV of the cortex in DKO brains relative to WT brains (B). The white line indicates the delineation between the cortical plate and intermediate zone, which was determined using DAPI staining (not shown). (C) To trace the migration of a discrete population of late born neurons, WT and DKO embryos were electroporated with GFP at E14.5 and collected the brains at E18.5. Brains were co-stained with FoxP1 (red) and Tbr1 (blue) to show that GFP+ neurons are found almost exclusively in layer II in the WT brain but are delayed in the intermediate zone (IZ) and lower cortical layers in the DKO. (D) To determine if pRb and p107 regulate radial migration cell autonomously, pRb f/f; p107-/- and pRb f/+; p107-/+ embryos were electroporated with Cre-GFP at E13.5 and brains were collected at E17.5. The location of GFP+ neurons was quantified according to cortical layer. Layer II was defined as being above FoxP1 staining (red), layer III/IV was defined as within FoxP1 staining, above Tbr1 (blue) and layer V/VI was defined as within the Tbr1 positive layer (E). We show that a portion pRb and p107 deficient neurons fail to reach layer II but instead remain in layer III/IV. The figure has been modified from Svoboda et al., 2012. Please click here to view a larger version of this figure. Table 1: Electroporation voltage by embryo age. Two of the primary challenges in performing in utero electroporations are 1) preventing embryo lethality and 2) decreasing variability between electroporations. One of the most important factors in preventing lethality is needle quality, as blunt needles inflict more damage to the embryo. When cutting the needle, keep the tip as long as possible while still allowing a visible droplet of 0.1-0.2 µl of fluid to appear following a pump of the foot paddle (Figure 1J). If the needle is too dull or the shaft too short, the resulting tissue damage could kill the embryo. Conversely, if the tip of the needle is too fine, it will take too long to inject sufficient plasmid volume; leaving the needle in the brain for too long causes damage due to unavoidable vibrations of the investigator’s hands and slight rotations of the embryo. Furthermore, use a microbeveler to make needles with a sharp, beveled tips to allow injections into younger, more fragile embryos, although this should not be necessary for embryos E13.5 and older. The stress level of the pregnant female is another key factor affecting embryo survival. The higher the dam’s stress level, the more likely she will abort the litter. For this reason it is important to minimize anesthesia time and change housing as little as possible before and after surgery. The background strain can also affect stress level and it may be necessary to outcross colonies prone to anxiety onto a strain such as CD1, assuming that the phenotype under investigation is maintained across different background strains. The single biggest limitation to IUE is the inherent variability between electroporations. Each electroporated brain is different due to variations in injection volume, paddle placement, paddle contact and embryo age. Since needles are variable, it is not possible to inject a fixed volume – rather the investigator must approximate the size of the green patch to deliver similar amounts to all embryos. Similarly, because the embryo is floating in a fluid filled sac, it is not possible to systematically measure the location and orientation of the paddles over the embryo’s head, as is done for stereotactic injections. Finally, slight differences in embryonic age can have significant effects on experimental results. For this reason, comparison between littermates is recommended. We are indebted to Pierre Mattar and Freda Miller for their assistance with the in utero electroporation and to Noel Ghanem and Bensun Fong for creating diagrams. We thank Linda Jui and Jason G. MacLaurin for excellent technical assistance. Equipment was supported by the Centre for Stroke Recovery. This work was supported by a scholarship from HSFO and OGS to D.S.S. and a CIHR grant to R.S.S. Hippenmeyer, S. Molecular pathways controlling the sequential steps of cortical projection neuron migration. Adv. Exp. Med. Biol. 800, 1-24 (2014). Evsyukova, I., Plestant, C., Anton, E. S. Integrative mechanisms of oriented neuronal migration in the developing brain. Annu. Rev. Cell Dev. Biol. 29, 299-353 (2013). Wu, Q., et al. The dynamics of neuronal migration. Adv. Exp. Med. Biol. 800, 25-36 (2014). McClellan, K. A., et al. Unique requirement for Rb/E2F3 in neuronal migration: evidence for cell cycle-independent functions. Mol. Cell. Biol. 27, (13), 4825-4843 (2007). Nguyen, L., et al. P27kip1 Independently Promotes Neuronal Differentiation and Migration in the Cerebral Cortex. Genes Dev. 20, (11), 1511-1524 (2006). Svoboda, D. S., Paquin, A., Park, D. S., Slack, R. S. Pocket proteins pRb and p107 are required for cortical lamination independent of apoptosis. Dev. Biol. 384, (1), 101-113 (2013). Hashimoto-Torii, K., et al. Interaction between Reelin and Notch signaling regulates neuronal migration in the cerebral cortex. Neuron. 60, (2), 273-284 (2008). Ori-McKenney, K. M., Vallee, R. B. Neuronal migration defects in the Loa dynein mutant mouse. Neural Dev. 6, (2011). Wang, H., Ge, G., Uchida, Y., Luu, B., Ahn, S. Gli3 is required for maintenance and fate specification of cortical progenitors. J. Neurosci. 31, (17), 6440-6448 (2011). Heng, J. I., et al. Neurogenin 2 controls cortical neuron migration through regulation of Rnd2. Nature. 455, (7209), 114-118 (2008). Alfano, C., et al. COUP-TFI promotes radial migration and proper morphology of callosal projection neurons by repressing Rnd2 expression. Development. 138, (21), 4685-4697 (2011). De Vry, J., et al. In vivo electroporation of the central nervous system: a non-viral approach for targeted gene delivery. Prog. Neurobiol. 92, (3), 227-244 (2010). Dixit, R., et al. Efficient gene delivery into multiple CNS territories using in utero electroporation. J. Vis. Exp. (52), (2011). Saito, T. In vivo electroporation in the embryonic mouse central nervous system. Nat. Protoc. 1, (3), 1552-1558 (2006). Elias, G. M., Elias, L. A., Apostolides, P. F., Kriegstein, A. R., Nicoll, R. A. Differential trafficking of AMPA and NMDA receptors by SAP102 and PSD-95 underlies synapse development. Proc. Natl. Acad. Sci. U.S.A. 105, (52), 20953-20958 (2008). Bhuiyan, M. I., Lee, J. H., Kim, S. Y., Cho, K. O. Expression of exogenous LIN28 contributes to proliferation and survival of mouse primary cortical neurons in vitro. Neuroscience. 248C, 448-458 (2013). Rice, H., Suth, S., Cavanaugh, W., Bai, J., Young-Pearse, T. L. In utero electroporation followed by primary neuronal culture for studying gene function in subset of cortical neurons. J. Vis. Exp. (44), (2010). Yoshida, A., Yamaguchi, Y., Nonomura, K., Kawakami, K., Takahashi, Y., Miura, M. Simultaneous expression of different transgenes in neurons and glia by combining in utero electroporation with the Tol2 transposon-mediated gene transfer system. Genes Cells. 15, (5), 501-512 (2010). Miyagi, S., et al. The Sox-2 regulatory regions display their activities in two distinct types of multipotent stem cells. Mol. Cell. Biol. 24, (10), 4207-4220 Forthcoming. Wang, X., Qiu, R., Tsark, W., Lu, Q. Rapid promoter analysis in developing mouse brain and genetic labeling of young neurons by doublecortin-DsRed-express. J. Neurosci. Res. 85, (16), 3567-3573 (2007). LoTurco, J., Manent, J. B., Sidiqi, F. New and improved tools for in utero electroporation studies of developing cerebral cortex. Cereb. Cortex. 19, Suppl 1. 120-125 (2009). Bouabe, H., Gene Okkenhaug, K. targeting in mice: a review. Methods Mol. Biol. 1064, 315-336 (2013). Ferguson, K. L., et al. A cell-autonomous requirement for the cell cycle regulatory protein, Rb, in neuronal migration. EMBO J. 24, (24), 4381-4391 (2005). Lagace, D. C., et al. Dynamic contribution of nestin-expressing stem cells to adult neurogenesis. J. Neurosci. 27, (46), 12623-12629 (2007). Andrusiak, M. G., Vandenbosch, R., Park, D. S., Slack, R. S. The retinoblastoma protein is essential for survival of postmitotic neurons. J. Neurosci. 32, (42), 14809-14814 (2012). Shan, B., Chang, C. Y., Jones, D., Lee, W. H. The transcription factor E2F-1 mediates the autoregulation of RB gene expression. Mol. Cell. Biol. 14, (1), 299-309 Forthcoming. Ferland, R. J., Cherry, T. J., Preware, P. O., Morrisey, E. E., Walsh, C. A. Characterization of Foxp2 and Foxp1 mRNA and protein in the developing and mature brain. 460, (2), 266-279 (2003).